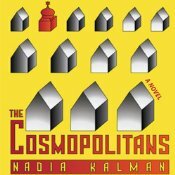 Elizabeth is excited to announce her latest audiobook release: The Cosmopolitans by Nadia Kalman, now available at Audible. Equal parts Jane Austen and Gogol, The Cosmopolitans casts a sharp and sympathetic eye on the foibles and rewards of family and life in America. This warm and exuberantly comic debut tells the story of the Molochniks, Russian-Jewish immigrants in suburban Connecticut. Daughters wed, houses flood, cultures clash, and the past has a way of emerging at the most inconvenient moments (and in the strangest ways). You can read more about the novel on Kalman’s website, and can listen to a sample of the narration at Audible. This is Elizabeth’s tenth professional release in 2013, right at the end of the year! (Check out the rest of her professional audiobooks on the Credits page.) Elizabeth also released six free LibriVox solos this year: Pauline’s Passion and Punishment, Moving the Mountain, The Letters of Jane Austen, Sanctuary, The Custom of the Country, and Maude. It’s been a great year, and Elizabeth would like to thank everyone who visited and commented on this site, on her Facebook page, and her Twitter feed. Happy 2014, everyone!